Marshal of the Soviet Union Georgy K. Zhukov (December 1, 1896 – June 10, 1974), the commander of the 1st 1st Belorussian Front during the Battle of Berlin, visits the Reichstag the day after it fell, on May 3, 1945. Already the building is covered in Cyrillic graffiti. Some of the words on the pillar behind Zhukov read "Misha" "Antokhin" and "cousins". Zhukov is accompanied by Soviet Red Army General Nikolai E. Berzarin (April 1, 1904 – June 16, 1945) commander of the 5th Shock Army during the battle, the first unit to enter Berlin. Tsarist tradition awarded command of a besieged city to the first general to enter it. Bezarin was made the commander of the Berlin Occupation Forces. Berzarin was killed in a truck accident a few weeks later, an accident that some suspected to be an assassination by elements of the NKVD, Stalin's secret police. Also with Zhukov is Lieutenant General Konstantin F. Telegin (November 3, 1899 - November 16, 1981) Zhukov's deputy and political Commissar. Telegin was denounced when Zhukov fell out of Stalin's favor in 1947 and was rehabilitated when Stalin died in 1953. Acting as their guide is Arthur H. W. Pieck, son of Wilhelm Pieck (December 28, 1899 - January 13, 1970), the future first President of East Germany. Pieck is on the left and has a sling holster with a belt buckle. The younger Pieck served as an interpreter for Berzarin's 5th Shock Army. While visiting the Reichstag, Zhukov added his name to the graffiti and talked with the soldiers that stormed the building for an hour. 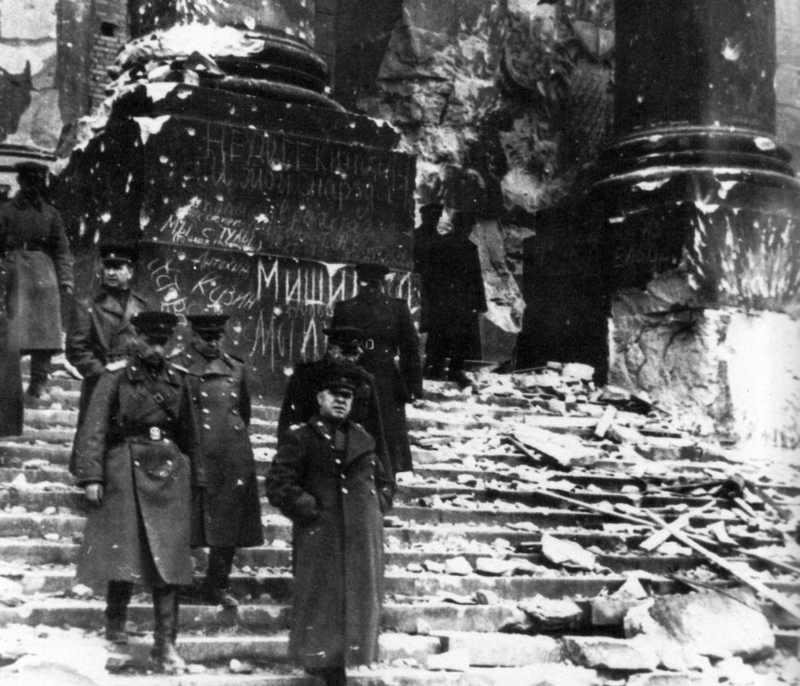 The same day, Zhukov toured the ruins of the Reichskanzlei ("Reich Chancellery") and the Fuhrerbunker. There, he refused to see the bodies of the Gobbels children, and was present when the bodies of Gobbels and his wife Magda were found. His primary purpose was to confirm that Fuhrer and Reichskanzler ("Leader and Reich Chancellor") Adolf Hitler was indeed dead. Zhukov was unaware that his own 3rd Shock Army had found the bodies of Adolf and Eva Hitler (nee Braun) and had taken them West. In 1965, Yelena Rzhevskaya, a member of the team that confirmed the bodies were the Hitlers published her memoirs in Moscow, but Zhukov rejected this account because he could not accept that troops subordinate to him didn't inform him that Hitler was found and because Stalin refused to tell Zhukov what had happened to the bodies. Historians differ on Stalin's motivations. The most charitable explanation is that Stalin wished to keep information from the West; it's likely that he enjoyed frustrating Zhukov's investigation into Hitler's last days. Zhukov later received the salute at the June 24, 1945 Victory Parade in Moscow at Stalin's insistence, but was later purged from the Red Army because Stalin felt he was a threat to the Dictator's regime. Unable to condemn him to death, Zhukov was isolated and forgotten until Stalin died in 1953. Zhukov was again purged by the Red Army in 1957 for failing to support the attempted coup against Soviet Premier Nikita Khrushchev. Khrushchev did not return the favor, allowing Zhukov's wartime rival, Marshal Ivan Koniev, to preside over a court martial of Zhukov. Zhukov remained apart from Soviet politics for the rest of his life.